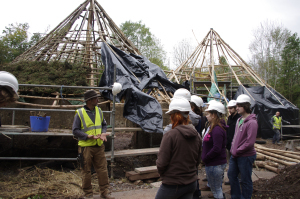 Have you ever thought about building a house…not just any house…but an Iron Age roundhouse!? The thought never came to my mind, until I saw a poster next to Dr Olly Davis’s office at the University. St Fagans National History Museum needed the assistance of CAER Heritage Project volunteers to help out and test our knowledge, endurance in a bad weather, and our physical fitness in a bit of experimental archaeology. By StonehengeNews in Uncategorized on February 7, 2015 .